February is Black History Month, and Spartanburg School District 7 is proud to join school districts, organizations and groups from around the nation in celebrating the many contributions made by Black and African Americans to our society. Each of our schools will celebrate Black History Month with a variety of educational and enrichment activities throughout February. African-American history is part of the year-long curriculum at all levels, but teachers and students will take extra time throughout the month for further exploration of significant historical figures and events. Displays throughout the schools will feature art, literature and general information reinforcing the curricular programs while a multitude of assemblies, programs and classroom-specific activities will emphasize the history and significance of African-Americans throughout history. Throughout the month, on our website, we will share stories, events and programs celebrating Black History Month from some of our schools. 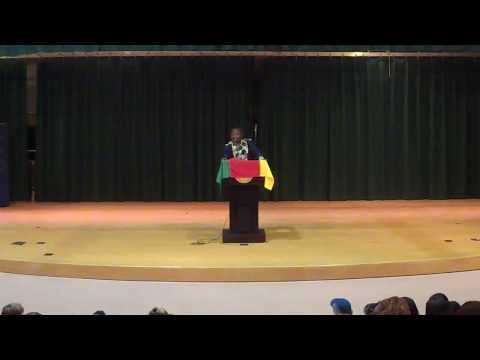 We invite you to McCracken Middle and present to you, Mr. Omgba, from Cameroon. Mr. Omgba teaches French at Carver Middle and McCracken. This is his first year in D7. He is the hope for his family and has validated life in Africa and the desperation for so many. Let this February be a reminder for some and a lesson for others that there is no American history without black history.